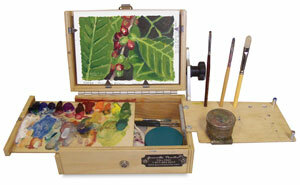 No other choice in pochade boxes offers so much quality and utility for so little money as Guerrilla Painter. Beautifully engineered and constructed, the Guerrilla design has been perfected for more than 25 years by plein air painter Carl Judson for maximum durability, versatility, and portability. 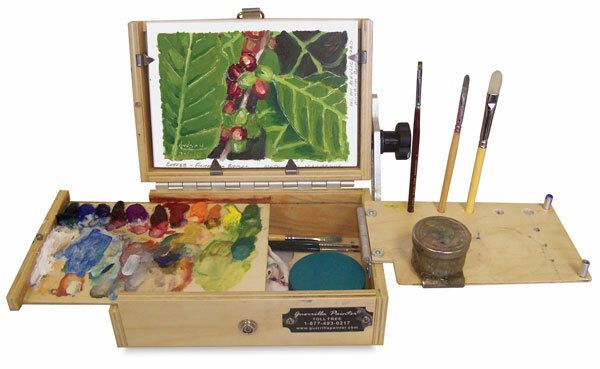 Guerrilla Painter's super-lightweight, tiny, "studio in a box" Pocket Box is a true, traditional "pochade box" with room for oil or watermedia essentials. Lightweight, compact, and convenient, it weighs only 1 lb, yet it holds two wet panels in the lid. Open the lid and you're practically ready to start painting — simply adjust and lock the lid in any position over 180°. Close the lid and everything is completely protected and ready to transport. Unlike many other pochade boxes, the Guerrilla Painter Pocket Box is perfectly balanced for laptop or tabletop painting. It is also pre-drilled for the addition of a universal tripod mount or bumper feet, if you choose to add them. The Pocket Box is constructed of strong, lightweight wood laminate with rust-proof stainless steel and aluminum hardware. The Pocket Box measures 8" × 5½" × 3" (20 cm × 14 cm × 7.6 cm) and weighs 1 lb (0.5 kg). Palette Extension Kit — Double your work space and increase the flexibility of your Pocket Box with this hinged palette extension. Made of birch plywood and aluminum, it features holes to rest your brushes, and little metal feet that keep it elevated above your palette when closed. It easily attaches into the existing pilot holes on the Pocket Box. Note: With the Palette Extension Kit installed, the Pocket Box will only accommodate one wet panel. Pocket Bristle Brushes, Set of 4 Filberts — These brushes are just like Guerrilla Painter brushes, but made to Guerrilla Painter's exclusive specifications to fit the Pocket Box and ThumBox. High-quality, interlocked Chungking bristles are inserted into nickel-plated ferrules and attached to two-tone wood handles. The four-brush set includes one each of Filbert size 2, 4, 6, and 8. Pocket Box Kit — This set includes a Guerrilla Painter Pocket Box, Pocket Box Bag, Large Mouth Single Palette Cup, Mighty Mite Jr. Brush Washer, Set of 4 Flat Pocket Bristle Brushes, 5" × 7" Plein Air Gessoed Panel, and Composition Finder, plus A Guerrilla Painter's Notebook volumes 1 and 2 (containing company founder Carl Judson's essays on his adventures in Guerrilla Painting). Pocket Box Bag — This zippered nylon tote includes a large outside pocket for supplies, a small pocket on the back for an ID card, a mesh interior pocket for paints and brushes, and a nylon shoulder strap. The bag weighs ½ lb and measures 10" × 6½" × 4" (25 cm × 17 cm × 10 cm). Tripod Mount and Rubber Bumper Feet Set — Your Guerrilla Painter Pocket Box is ready for any tripod with this universal tripod mount that affixes easily with the included screws to the pre-drilled holes in the Pocket Box. Four rubber bumper feet are also included. ® Guerrilla Painter is a registered trademark.™ Pocket Box is a trademark. ThumBox is a trademark.